Last Saturday's expected games got rained out and moved to yesterday. Finally, Maddie got to have her HS debut. 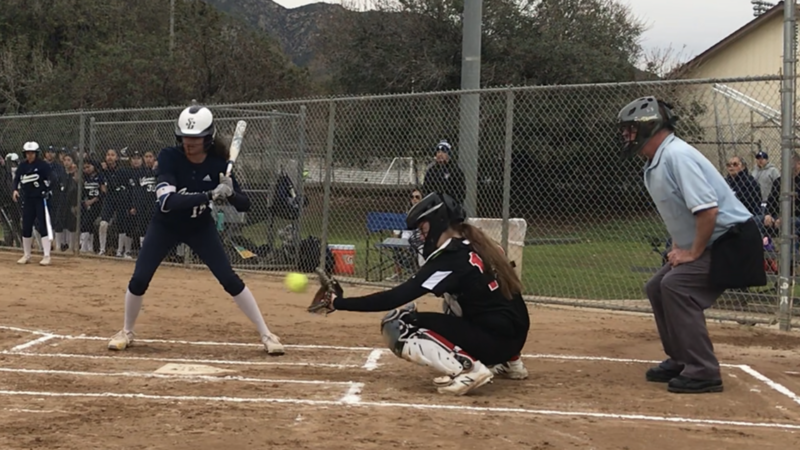 Maddie played every inning of both pool-play games behind the plate, and turned in a very solid performance - 1 runner caught stealing, 4 outs on pop-ups, and a very nice play on a bunt. She made 5 of her team's first 9 outs on defense. With her bat, she went 2-for-2, 2 BB, 2 SB (including stealing home). She was also given the job of calling pitches. Unfortunately, her team lost both games pretty badly. My observations...The difference between the TB girls and the ones without TB experience is pretty vivid. Plays that are routine in TB, aren't with this team. I like the HC. He's a good guy, with a genuine love for the game, and a positive attitude, but there were a few things that left me scratching my head. That said, he's still figuring out what he has to work with and how they handle themselves in games, so I'm going to cut him some slack and remind myself that there was almost no team at all this season. While talking about things after the game, I advised Maddie to make sure she keeps playing her game at the highest level she can, and bring her teammates up, rather than bringing her game down. In response, she had a valid point that there are some plays that are automatic with her TB team that the HS girls don't have the quickness and throwing speed to pull off, so she's going to have to make an adjustment in her approach in some situations (runners at 1B and 3B, for example). One thing that became very clear during our conversation was her level of understanding of the complexities of the game. I may have underestimated her a little bit in that area. Although it would have been nice to see her team have better results in their first games, I couldn't be prouder of Maddie. She’s off to a great start! Congratulations! I’m sure it’s tough playing with girls with no travel experience. Sounds like the team could benefit from working on picks and throw downs. I don’t have to tell you how important it is to steal an out or two a game. The key is to find opportunity within the season to push yourself to work on things she might be reluctant to try during a travel season where competition heats-up. And, of course, to find a way to enjoy playing the sport she loves with the girls shes grown-up with. There is certainly value in that. We have talked about staying focused on her own development. She going to be facing a few pitchers that are way more challenging than anything she has faced before. These will be tests she can learn from. Maddie hasn't actually played with any of her HS teammates before. The ones she has played with are on JV. She's making new friends, which is a very good thing for her. I also see her team and school spirit growing, which is also a good thing. That is such a great photo. Thumb under, head over the glove. Strike 3 called, I hope? As a parent in your shoes last year (Freshman starting catcher on Varsity with a team that has room for growth I'll say) it is an adjustment, but soak in every second. She was also given the job of calling pitches. Not a terrible start for Maddie's team...2-3 in their first tournament. Their most recent game was a win against a team that they had lost to in their very first game. Hitting and defense both seem to be getting better every game. HC has commented to me that many of the girls are stepping up their game in response to what Maddie is bringing to the field. Additionally, the #1 P loves her, and is very happy to have Maddie behind the plate. I don't think it's going to be a winning season, but it's looking like they will be more competitive than recent years. For Maddie, so far, she's batting #3 in the lineup every game. Hitting...6-for-8, 2 BB, 0 K, 2 SB. In 4 SB attempts by the other teams, she's erased 2. On Monday, after her game, she went straight to her weekly strength session...still in her uniform. I'm pretty damn proud of this kid.